June Rhodes Hicks, BA (Hons) 1956, MA (1960). June Hicks was born in Yorkshire and has lived in Cornwall since 1957. She studied at the School of Art in Penzance with Bouverie Hoyton and John Tunnard and later learned to etch with Joan Whiteford. 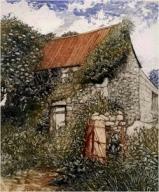 In 1987 she opened her own etching workshop and small gallery at Trevescan, near Sennen. Her work is now in private collections and galleries in Cornwall and beyond. She is a founder member of the Penwith Printmakers, and belongs to the Small Print Gallery co-operative in Penzance.